Pacific Energy (PEA) announced an additional 11 Megawatts of power generation capacity for their Western Australian Pilgangoora lithium project this week. The award takes year-on-year growth to 8.0%, with a good chance of further contract awards in the near term. PEA’s take-or-pay contract structure offers defensive earnings, a positive growth outlook and grossed up dividend yield of 4.1%. 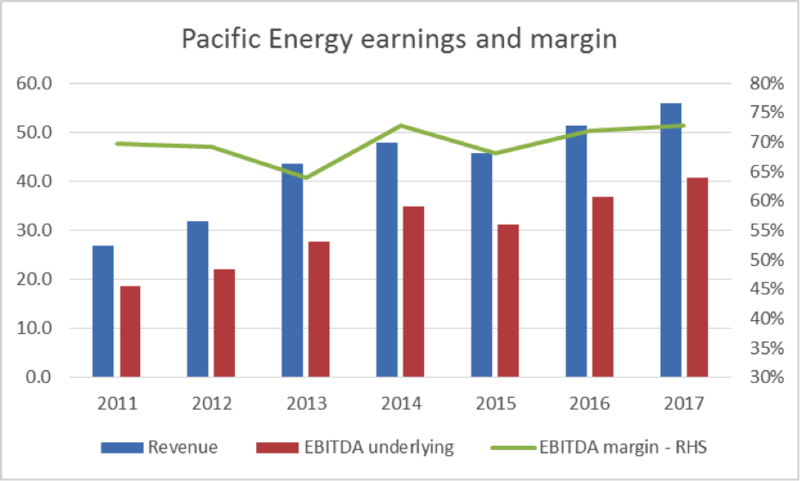 Currently trading at a 21.0% discount to the Industrial average price to earnings, we view PEA as offering good value exposure to a defensive earnings stream with a positive growth outlook. PEA provides remote power solutions to a wide range of mining projects, primarily based in Western Australia. The company’s long standing dedication to research and development has resulted in continuous efficiency gains in power generation. The result being, PEA continues to win new work while maintaining healthy margins in a very competitive sector. PEA’s core offering is cheap, remote diesel and/or gas powered generation. It also offers solar power solutions via its joint venture with Juwi and was a key contributor to the largest off-grid solar installation in Australia. Contracts with customers are structured as take-or-pay over the contract period, providing PEA with a defensive earnings stream and security of return on its investment in generation sets, which it maintains and retains ownership of. The steady stream of equity raisings in the gold and lithium space over the last 6 months has provided a number of opportunities for further contract awards. In particular, new mines being constructed by Dacian Gold Limited and Gascoyne Resources Limited are in the sweet spot of PEA’s product offering. These are just two projects out of a 114 megawatts tender pipeline, which compares with 278 megawatts currently contracted. For the first time in its history, PEA is now pursuing international growth, targeting sub-Sahara Africa. The market is ascribing no value for this initiative at the current share price, despite a clear need for remote power generation by a large number of Australian domiciled mining companies. In our view PEA offers an appealing mix of defensive earnings, yield and growth, at a discount to market. It is held as a high conviction idea across our small and micro-cap trusts.